1. Under European CE standard designing, Passed CE certificate, With CE or UL certificate for Electric Parts and with safety device, such as, emergency stop and so on. 2. Most of parts are precisely processed by numerical-control machine; The key mechanical parts are under CNC processing; While the main outsourcing parts are world famous brand. 3. This machine adopts advanced servo driving, PLC system and touching-screen operating system. This machine can materialize successive production (without stop machine), stable running and high production efficiency. 4. 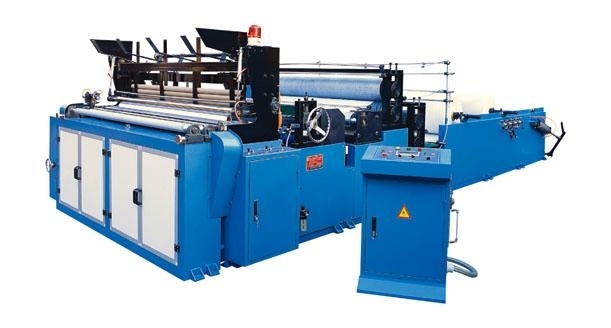 This equipment is consisting of rewinding & perforating machine, conveyer, log accumulating system, cutting machine and packaging machine.